Alison Crawford made it to the girls' semi-finals but was finally voted off after the 6th live vote. Congratulations Alison for a job well done! Maybole and Scotland are proud of your accomplishments! Alison is very proud of her Maybole and Scottish roots. She was raised up within a musical family. Her father encouraged Alison to learn Burns poems and songs from an early age. 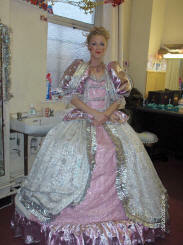 Alison has starred in stage shows in Liverpool and played the lead in Cinderella. She has also had small parts in Brookside and other television programmes. 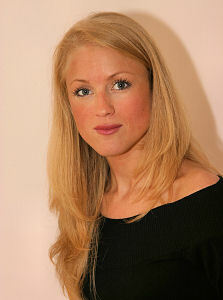 Alison currently resides in Liverpool. Born in Birmingham she is the daughter of David Crawford formerly of Kirkoswald Road Maybole. David is the son of Andy Crawford, aka 'The AA Man'. David's brothers are Andy, Alistair and Kenny Crawford. Kenny was for 6 years the Stadium Manager at Rangers Football Club. David also has a sister , Sheila. All of the family attended Carrick Academy. David was educated at Carrick Academy from 1958 until 1966. The family moved to Birmingham, in 1966, following their father's promotion to Chief Superintendent of the AA in the West Midlands. Note: Latest video of Alison with Bradley Clarkson is on the right as added to youtube July 2nd 2007. Two clicks to play the video. Two clicks to play the videos. Click an image below. Then click on the arrow to play the video. You can play all of them at once! Alison's audition and acceptance into bootcamp. A few more photos of Alison earlier in her career. Click on the images to view full size.